Gold medals won by Arsen Galstyan, Mansur Isaev and Tagir Khaibulaev at the London Olympics have put Russia on the global judo map. Boris Yeltsin’s attempts to popularise tennis in Russia led to an unprecedented level of interest among the youth of the country. In a decade, Russia became an international force to be reckoned with in the world of tennis, producing grand slam champions in both the men’s and women’s versions of the game, although Russian women have managed to outshine their male counterparts. Vladimir Putin, who was until 2 weeks ago Russia’s most famous judoka, probably dreamt of ushering in the kind of results in judo that his predecessor managed with tennis. 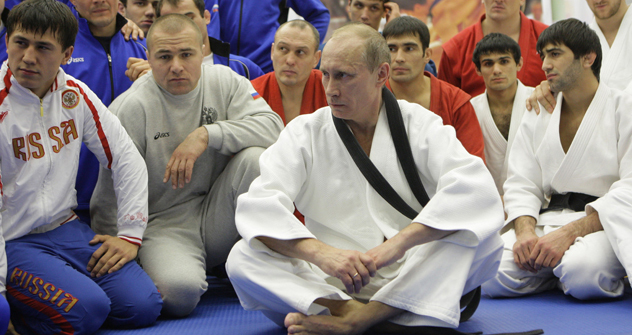 In fact, a lot of emphasis was laid on the development of judo by Putin during his first term as president. Judo, however, does not have the kind of international mass appeal and popularity that tennis enjoys. So, despite the fact that Arsen Galstyan won a bronze at the 60 kg event in the 2010 World Championships in Tokyo to add to the European gold won a year earlier in Tbilisi, hardly any sports commentator listed the judoka from the Krasnodar Region as a gold medal prospect. The buzz around Galstyan started only when he shocked the international judo fraternity by defeating the number 1 ranked judoka in the 60 kg category, Uzbekistan’s Rishod Sobirov in the semi-finals. The victory over Japan’s Hiroaki Hiraoka in the final made the 23-year old an instant sensation across the country, especially in the flood-ravaged territory of Krasnodar that Galstyan calls home. Galstyan’s victory was toasted by the residents of the Krasnodar Territory as “our” victory and there is very little talk of the judoka’s Armenian origins. This is, however, a great story for the southern Russian region that has occasionally been in the news for racial flare-ups between ethnic Russians and immigrants from former Soviet republics. Galstyan was born in Armenia in 1989, when the country was a part of the Soviet Union. His parents immigrated later to Russia. By winning the gold medal in London and becoming a national hero, Galstyan has fulfilled the immigrant dream of his family. After Galstyan struck gold in London, Mansur Isaev followed suit by defeating Japan’s Riki Nakaya in the 73-kg class final to get Russia’s second judo gold medal. The 26-year old resident of Chelyabinsk, a small city in Siberia, was again, not someone that most pundits were predicting to win a medal in London. Isaev’s best performance before London was a bronze medal at the 2009 World Championships in Rotterdam. Finally, Tagir Khaibulaev, another Russian judoka captured Olympic gold with President Vladimir Putin in attendance Thursday. It remains to be seen whether the governor of the Chelyabinsk Region will honour a pre-Olympic promise in which he promised to give US$1 million to each gold medal winner from the region. Isaev, never the less, has become an instant celebrity and household name in Russia and no doubt has pleased the Russian president. Isaev is also a poster-child for multi-ethnic Russia, being a Muslim and an ethnic Avar, a community with origins in the Republic of Dagestan. One of the keys to Russia’s gold haul in judo in London was the hiring of Ezio Gamba, who won a gold medal for Italy in the 71 kg class event in the 1980 Moscow Olympics. Both Isaev and Galstyan gave a lot of credit to their Italian coach and his rigorous workout regime. The seeds of success for the duo were probably laid by the Russian President, who has taken a proactive role in the development of his favourite sport. In an interview with a Russian television channel, Galstyan spoke of his New Year’s Eve meetings with the president. In addition to encouraging Russian judokas, Putin was the brainchild behind the Zvenigorod Judo Academy, a facility that promises to produce many more champions. Surveys have shown that the Russian President enjoys a lot of popularity in the distant regions of the country. The gold medals won by residents of Krasnodar and Chelyabinsk, two cities, far away from Moscow, show that the president’s efforts to popularise the sport struck a chord in the smaller regions. The London gold medals are transforming the way Russians look at judo and are sure to usher in a new wave of popularity for the sport.